Attention: Please bring an Internet-capable laptop 💻📡 to the conference if possible; we will be doing and checking textual analysis work on computers. 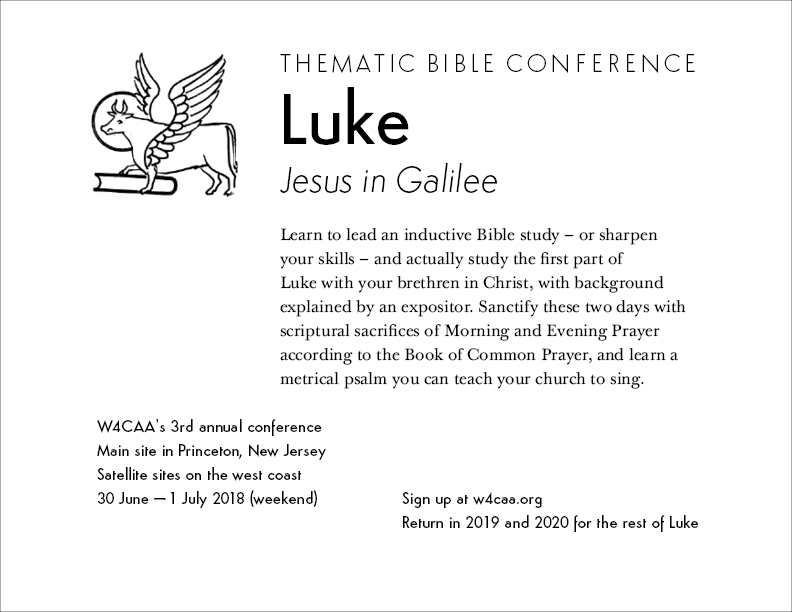 W4CAA will hold a Bible conference in Princeton this summer, 30 June – 1 July 2018, to the theme ‘Luke: Jesus in Galilee’. We encourage all to attend at the main site in Princeton, but participation is also available at our satellite sites or through your own Internet connection. Please register below if possible; walk-in registration at the main site will be available 30 June – 1 July at the Erdman Center in Princeton, and at satellite sites as well. St Luke the Evangelist, who wrote the Gospel of Luke, was a physician; Luke is a book of resilience and healing for the soul. At the conference, learn from Richard Yen and others to lead an inductive Bible study – or sharpen your skills – and at once study the first part of Luke (1.1–9.50, the first of three parts) with your brethren in Christ, with reflections from George Shen on the kingdom of God. On the second day, learn from Eric ‘Pak’ Liang to lead an evangelistic Bible study. Sanctify these two days with scriptural sacrifices of Morning and Evening Prayer (daily worship services) according to the Book of Common Prayer, and learn a metrical psalm you can teach your church to sing. Come to the conference to be empowered by God’s word and bring its healing back to your local church. You can also use Facebook to invite your friends to the Princeton or SoCal site. For reference, you may also see our pages for the conferences we held in 2017 and 2016, on the Gospel of Mark. Suggested reading for the night is Luke 6.12–49, with a focus on 6.20–49. On Sunday, participants in Torrance will say Morning Prayer for worship and hear a sermon from Richard Yen; participants at the Los Altos, however, will join the congregation of St Paul’s Anglican Church for Holy Communion, under the Rev. Steve Macias. Besides Princeton, the conference is to be held in the Los Angeles and San Francisco Bay areas. The Los Angeles site, sponsored by Foundation Ours, is in Torrance, about 15 minutes from LAX and 8 minutes from the Redondo station on the Metro green line is now in Alhambra. For more information, text Angie Chu at 818 400 1210. The Bay Area site is hosted by St Paul’s Anglican Church, Los Altos, not far from Stanford University; this church is also the location of Canterbury Christian School. Richard Yen, who has spoken at the Thematic Bible Conference before, will again train participants to lead inductive Bible studies. Dr Yen is well known for his involvement with the West Coast Chinese Christian Conference (WCCCC), for which he has served as staff, and as speaker and advisor, since 1971; he is also the founder and chairman of the W4C Alumni Association (W4CAA). Dr. Yen obtained his PhD degree in 1976 from the University of California, Berkeley, and researched human genetics at the University of California, San Diego. After practicing anæsthesia for 25 years at Kaiser Permanente, he took early retirement in May 2012. He is the CEO and founder of a privately held company specializing in the development of artificial platelets that can be used in cancer patients and in patients exposed to lethal doses of irradiation, such as after a nuclear event. Dr. Yen is the sole inventor of more than 30 US and international patents. George Shen will give a talk on the mystery of God’s kingdom according to Luke. He was born in Shanghai, China and grew up in Hong Kong. He went to University of the Illinois in Chicago to study Information Engineering. After he accepted the Lord in his junior year, his life changed, and this change also included a major change to Materials Engineering. Between his BS and MS program at U of I, he went to study at Moody Bible Institute in Chicago for a year where he met his future wife Lois. George worked as a New Product Development Manager and Clinical Affairs on orthopedic implants for Bristol Myers’ subsidiary Zimmer and holds 5 patents. After moving to California, he worked as a sales rep of orthopedic implants for Zimmer, Pfizer and Stryker. He has served as a Sunday School teacher since college and translator at Chinese churches, conferences and books for many years. George is a member of the Global Edenics Team in Chinese and contributed to the book The Origin of Speeches, Intelligent Design in Languages. He has co-authored articles on dental prosthetics, orthopedic implant and archeology. He retired in 2015 but in May 2017, he received an appointment from a Medical School in southern California the position of Adjunct Research Instructor of Orthopedic Surgery. Eric ‘Pak’ Liang will train participants to lead evangelistic Bible studies. Eric Liang believes learning never stops. He obtained his PhD in aerospace from Stanford, his BS and MS in mechanical engineering from UC Berkeley, and his MBA from UCLA. He has had 3 careers so far: in aerospace research engineering, high-tech product program management, and business and IT strategy consulting. He also serves as adjunct professor at The Master’s University in Valencia, California. God willing, he yearns for a fourth career, to make a difference for the Kingdom of God. He loves to write about faith, business, technology, and world geopolitics, and hosts a radio show on current events on AM 1430. In terms of Christian service, he is currently deacon at the Peace Evangelical Community Church in West Hills, California. Eric was chairperson of the West Coast Chinese Christian Conference back in the formative days of 1979 and 1980. Eric is an experienced Sunday School teacher and seminar speaker on Christian leadership and Bible studies. Peter Wong will give a talk in a Cantonese parallel session, ‘The Book of Luke through the First-Century Audience’, to put today’s Bible-readers into the shoes of Luke’s first intended audience, that they may hear and feel the text from first audience’s perspective. Peter is a Bible teacher, general secretary, and founder of Hadavar Yeshiva (For the Nations). His passion for teaching the Scripture in its original context has become a life’s journey of research and ministry, bringing to our Christian faith the unique perspective of understanding its Hebraic roots. He has been blessed with friendships with distinguished scholars in this field and studied at the Jewish Theological Seminary, the Institute for Hebraic-Christian studies, and the Biblical Life College and Seminary. Peter is passionate that all Christian believers should know our rabbi Jesus. Inspired by the Lord in his first trip to the Holy Land in 2004, Peter has turned his home into a museum for biblical artifacts and a garden for biblical plants. Christians of all ages can now see, touch, smell, and even taste Scripture. Today, his home museum and biblical garden has become Hadavar Biblical World in Hong Kong. Peter also leads study tours to the Holy Land and Turkey, with a passion to inspire others to study Scripture in its cultural context. Registration is now available online. Please register and pay as soon as you can, so that you don’t miss the deadline! Make checks out to West Coast Chinese Christian Conference Alumni Association. Registration for the 2018 is now closed. Conference attendees who require lodging in Princeton will need to book their own rooms at the Erdman Center. Rates at the Erdman Center are more reasonable than many elsewhere in Princeton. For lodging in the Los Angeles area, text Angie Chu at 818 400 1210. Individual and shared lodging are both available; rates vary.